Born in the Canary Islands in 1987, Andrés Acosta grew up surrounded by women skilled in the art of sewing and in the traditional silk embroidery of the island of La Palma. Since he was a child he was influenced by the creative talent of his parents, and lived in an environment that allowed him to develop his sensitivity to the arts, especially painting and music. These are the two great passions that imprint values such as harmony, balance and discipline in his vision. In his mother’s magazines he soon discovered an open window, out of which he leant, leading him to the world of fashion and beauty. It’s from that moment that he started sketching and creating original pieces of jewelry for his family and friends. The design, the styling or fashion communication are the way towards a new scenario that he fascinatedly contemplates from the distance and which begins to give sense to his true vocation. Upon turning 17, he moved to Madrid where he began his studies in PR & Advertising at the Universidad Complutense. 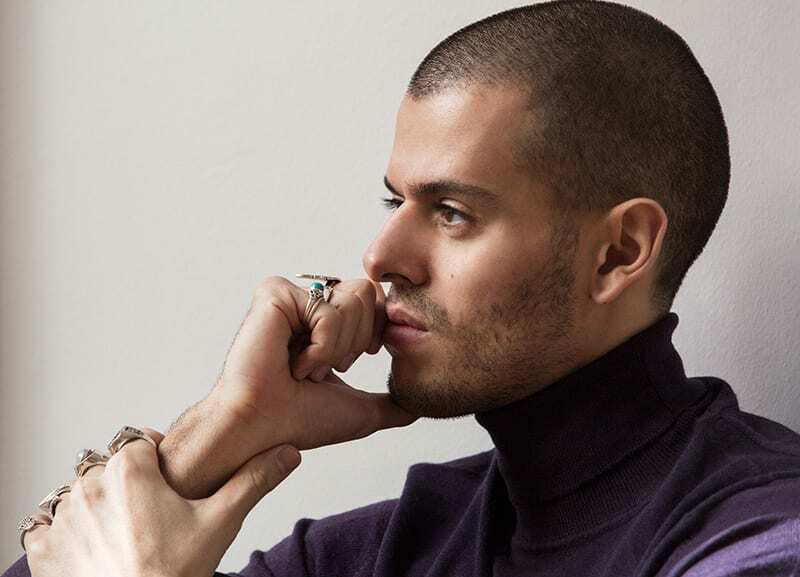 By the end of this period he entered the editorial world by the hand of Condé Nast Spain, the group in which he worked for 6 years as a stylist and fashion director of Condé Nast Traveler magazine. With the world at his feet thanks to his job, his list of visited cities has gained many new destinations, in which he finds endless sources of inspiration and always learns something new. In his luggage, his idols’ creations travel with him around the world to dress many of the top models or actresses that he used to see in his mother’s fashion magazines. Some of them today are his muses and friends. His trips to Paris are the ones that bring him closer to the magical universe of the Haute Couture. The exquisite creations of houses such as Elsa Schiaparelli, Christian Dior or Jean Paul Gaultier are the key to opening the doors to a different sensitivity towards the art of dressing. A force that draws him into the world which he feels he belongs to, and to pave the definitive step that will give meaning to his dream. In November 2016 Andrés Acosta presents “The Divine Presence”, his first collection of night and bridal gowns completely made in Spain. Eleven unique dresses that are the result of a dialogue between the creator and his muse. A love story in which luxury surrenders to every woman’s spirit, and in harmony with their body and soul reveals all their essence upon caressing their skin. 2017 begins with beautiful coverage on titles such as VOGUE, Vanity Fair, Elle, Glamour, Woman Madame Figaro, IoDonna or “T” New York Times Style Magazine gathering up in their pages interviews and fashion editorials filled with the designer’s work and creations. The stellar connection between the Divine Presence and the sky that inspires the designer consolidates in an exhibition framed in the “X Anniversary of the Starlight Declaration” celebrated in the Canary island of La Palma, where the Astrophysical Observatory of Roque de los Muchachos (one of the most important in the world) is located. Stars like Petra Nemcova, Tülin Sahin, Paris Hilton, Ariadne Artiles, Clara Alonso and Marta Ortiz have been some of the muses that have shined filling his creations with their Divine Presence in different international events. Metanoia is the name that baptizes the designer´s second collection. Fully tainted in all different tones of violet -his fetish color- it is an introspective trip that represents the rupture with everything that doesn’t allow the being to spread its wings. Body and soul balanced. A straight look facing off the mirror. The recognition of being.